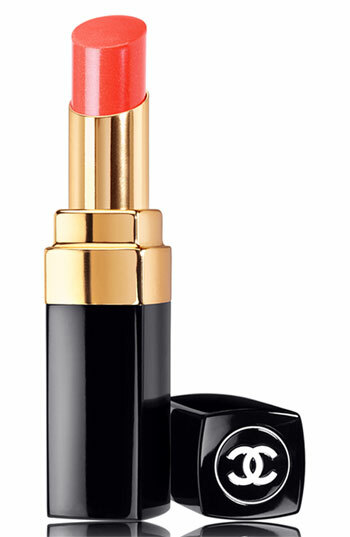 I have a new favorite lipstick and it is Chanel’s Rouge Coco Shine ($32 www.chanel.com). It goes on very smooth and it leaves the look of a gloss. It lasts forever and it looks so pretty with the little shine it gives off. You can wear it alone or wear it with a liner. My go-to color is Empreinte, it is a neutral but is so pretty for summer. It really moisturizers your lips so this feels great when you put it on. If you don’t wear lipstick give this a try because it is nothing like the “old school” lipstick you are thinking of! It comes in 20 colors so I know you will find your favorite too! I have really sensitive eyes and have used tons of different eye creams but a lot of them burn my eye area. I have been using Kiehl’s Creamy Eye Treatment with Avocado ($28 www.kiehls.com) for a while now and it is heavenly. It is a simple moisturizing eye treatment with avocado oil. It is formulated not to migrate into your eyes and it is sensitive enough for all skin types. Ever since using this my eye area has become brighter and my dark circles have reduced. One way to prevent fine lines and wrinkles is moisture and you can really feel like you are getting that when you put this on. It is a funny green color but it goes on clear. Just use a tiny amount and dab it on lightly with your ring finger morning and night. It is so funny because avocado’s are one of my favorite foods and now they are a part of my favorite skin care! If you need to start using an eye cream this is a good one to try or if you need more moisture for your eye area this is perfect! One of the things I worry about with the whole anti-aging process is having a neck that looks like a turkey! Have you every noticed those women that have great skin on their faces and their necks look 100 years older? 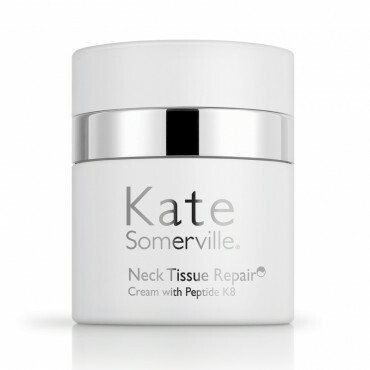 I really want to avoid that in my old age…So, in try to avoid gravity and neck wrinkles, I have been using Kate Somerville Neck Tissue Repair Cream With Peptide K8 ($150 www.katesomerville.com). The science behind Peptide K8 is that it is supposed to reduce the volume, density, and depth of fine lines and wrinkles. I have seen this in a lot of products lately. The other benefits of K8 is that it helps with texture and elasticity of the skin. Other ingredients help firm and tone as well as make the skin soft and smooth. One benefit is that the jojoba and macadamia nut help keep the skin moisturized and prevent water loss. When putting this on you only want to move this in an upward motion. I even put this on my bust line because I figure I need all the help I can get! You need one pump and move it in an upward motion toward your face to help activate the ingredients. The smell is divine and subtle so you won’t be smelling it all day long. If you are worried about looking saggy and wrinkly from the neck down, try this cream you won’t be disappointed! I am always buying and trying out new hand creams. I think I get bored and just want to try something new with a different scent and a new bottle or package…I think we all get that way with beauty products. However, I have been using a hand cream this winter that has saved my hands from getting all dried out from the winter weather. I have never found a hand cream that I loved as much as Nivea Smooth Indulgence Hand Cream ($5 www.drugstore.com). This hand cream contains macadamia nut oil and vitamins which help add moisture and soften dry hands. The smell is very “clean” and fresh. The best part is that it absorbs quickly and doesn’t leave a greasy residue on your skin so you can use your cell phone, key board or do other things right after applying it. I keep a bottle of this on my desk and use it after I wash my hands to keep them really soft. I have turned other people in my office on to it because of the smell and because of the great price! If you are looking for something to save your hands this winter, give this a try! All the experts say “moisturize, moisturize, moisturize!”, but I hate the feeling of having really wet or sticky skin before I put on my makeup. 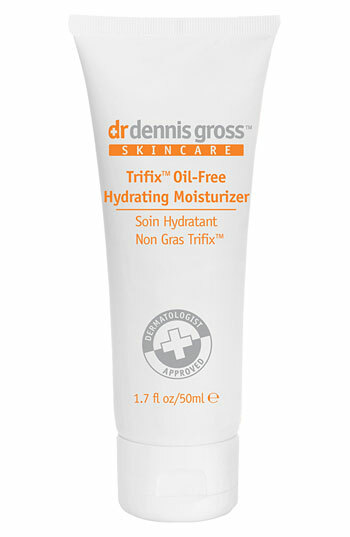 For the past month I have been using MD Skincare Trifix Oil Free Hydrating Moisturizer ($35 www.dgskincare.com) and it is the perfect moisturizer if you don’t care too much for that “moisturizer” feeling. It is fast absorbing and really gets deep into the skin, rather than sits on top of the skin surface. It is oil free so it won’t clog your pores and it contains willow bark extract which helps fight blackheads and congested skin. It is very light weight and non-greasy, a little goes a long way. It has aloe, along with vitamin and mineral benefits which help fight inflammation and redness. This is a really great moisturizer for acne prone skin or combination/oily skin. It feels really great on your skin and doesn’t feel “heavy”. If you are looking for a lightweight moisturizer to go under makeup this is a great option. It provides great hydrating benefits as well as clear skin benefits, it is a new favorite of mine! ‘Hope In A Bottle’ Is Back! 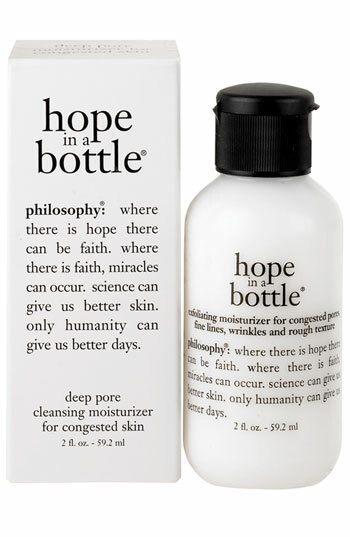 One of the best things that ever happened to my skin was Philosophy’s ‘Hope In A Bottle’ ($39 www.philosophy.com). It is a moisturizer for adult acne prone skin, but mainly focuses on congested skin. I wear make-up every day and with all the hormones racing through my body sometimes my skin becomes simply congested. When I was having these issues a couple of years ago and I was talking with my little sister, she recommended trying this. Let me tell you, this should really be called ‘Miracle In a Bottle’. This cleared my skin up and also moisturized it at the same time. I was using it faithfully until last spring when the company decided to discontinue this product! My sister and I were devastated! They had another “similar” product but it did not feel the same or give the same results. After a lot of hoping and praying, Philosophy finally decided to bring it back! The moisturizer is very light and is oil-free. It goes on smooth and absorbs into your skin which makes it great for using before applying make-up. It contains Salicylic Acid to combat break-outs and Vitamin E to help with inflammation. It also has anti-aging properties to fight fine lines and wrinkles! It has a clean smell, which you don’t really seem to notice at all. I use it morning and night and it doesn’t dry my skin out all. You can even put another moisturizer on top. I really recommend this to anyone that is having trouble with break-outs. This was my “go-to” product forever and I am so glad it is BACK!